Wow! It's been some time since I've posted. There have been a number of times I wanted to but then I got distracted by this and that. We are in a heat wave right now, although I know there are hotter places than here, it's hard for us not used to it to handle. Poor little Titus has been lying around in our heat apartment trying to keep cool. I've put ice packs around him so at least some sort of cool air evaporates for him. I've also been trying to get in shape with eating better and exercising, yet I feel like a slug in the heat!! I know a number of people go to the gym, where it's nice and cool, but I just can't really afford paying a monthly gym membership at the moment. So to catch up. I've gone to a stagette on an island, a wedding, farmer's markets, short bike rides, visits with friends, Barnston island with my mom, uncle and hubby, and more doctor's appointments! Yay! Stitching has happened and I'm so glad I got two RAK's finished. I put crocheting down for the moment since the yarn is too hot to work with at the moment. 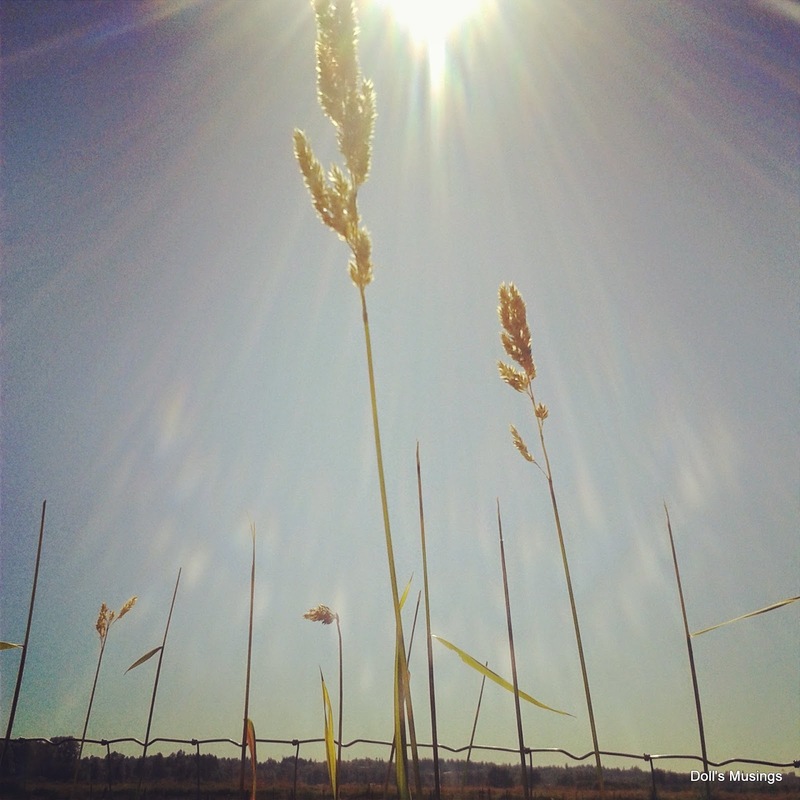 How about a little picture walk for everyone? A little Primitve Hare freebie finish. Love bees and will be finishing it as a prim pillow. Eyelet progress on the BBD's Her Sampler SAL. Hoping to forge ahead on finishing the eyelet bands tonight. Sarah Chapple grass complete!! It took an age to do. Grass stitching is great for watching shows though. Some JCS 1707 progress. The vines got tricky and my eyes get tired from counting. I think the chart's symbols are a wee bit too small for me. Stash buying from over a month ago. Forgot to post a photo of some Goode Huswife charts I found at an online store. Also I had to get a few of Nina's threads to try out. Granny Stripe progress...three rows before the heat came. Titus is such a good little model. One more thing related to stitching. The other day I received a most wonderful RAK in the mail from Mii!! She knew I was having a rough time last month and the sweetheart that she is, mailed me the most beautifully stitched pinkeep and little treats for me. I was very surprised and it made my month!! Her attention to detail is amazing. I love the saying "Good things come to those who stitch" and I sure think it does. She also included some pretty threads, polka dot fabric and yummy chocolate bars! Thank you Mii!! Many hugs to you!! Enjoy the rest of my photos of some of my adventures these past few weeks. Wild and crazy boat ride to Bowen Island with 15 girls and gays...lol! 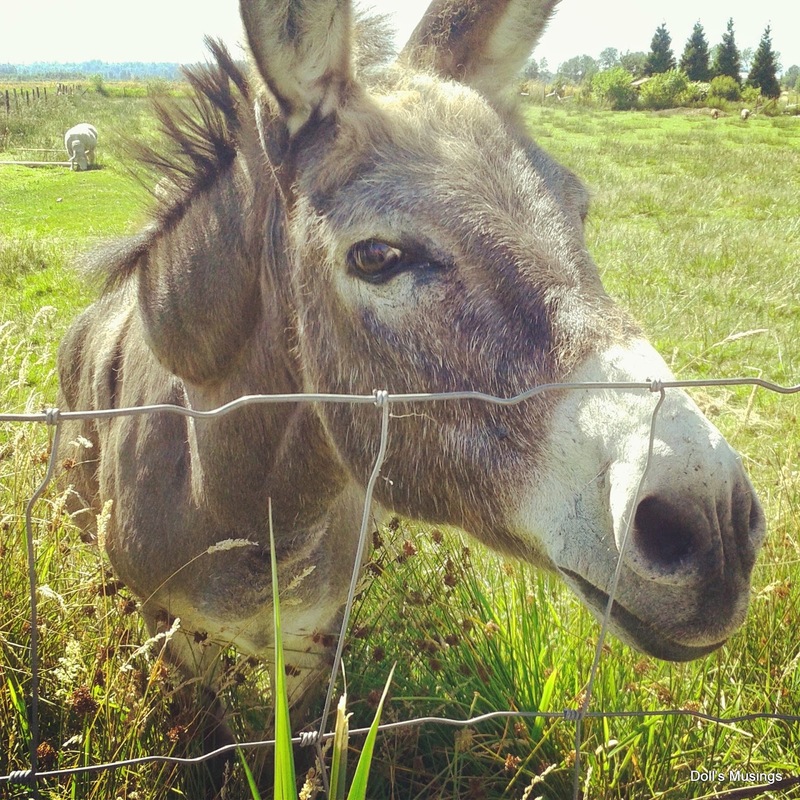 Barnston island donkey. Hubby called him over with a strawberry...so cute! A young, loud baaing ram. He took off after this. 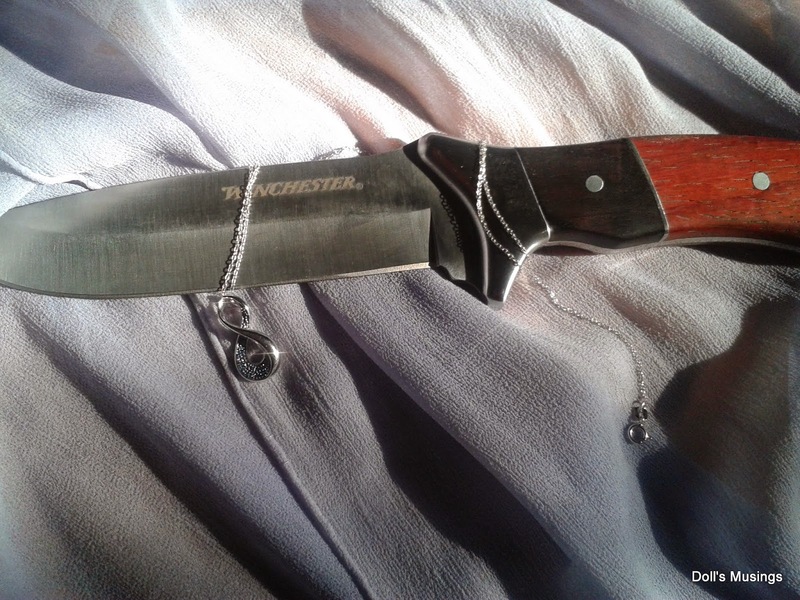 My darling hubby bought me this gorgeous blue diamond, white gold necklace and a knife! Brawn and beauty as he says!! No post is complete without a photo of Titus. Hoping to come by and visit people soon. I thank you all for staying with me and giving me support during a hard time. Bloggy/stitchy friends are the best and I feel like a bad one not coming by...so I mean to make an effort this week! Hugs to you all and keep cool!! I know just how you and Titus feel. This heat is not good!!!! !But you have taken some great trips and done some wonderful stitching!!! Wow beautiful stitching and super pictures. Tito is so so lovely. 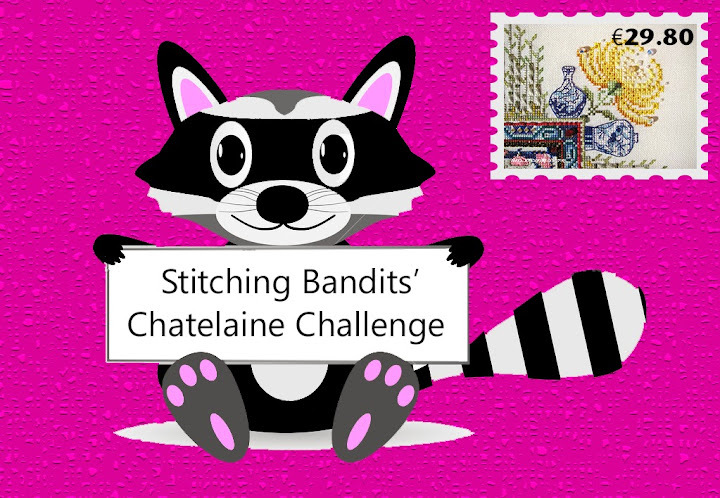 Your stitching is really lovely, I had a good look at what your stitching and really love all the designs... They are all so pretty.. And full of detail! I will pop back again as I know watching them grow will be lovely. Your cat is adorable.. So much fur!! Lots of pretty stitching. You've caught the prim bug, haven't you! It's been hot here too, but I'm more of a hot weather person than a cold one, so I really can't complain. You don't have to shovel heat! But I wouldn't touch winter knitting or crocheting at this time of year. Luckily stitching is year-round activity! Fun RAK from Mii. What a nice thing to do. Happy to read a post from you today. Great projects ...great stash. Great stitchy progress & fantastic new stash. It sounds like you're having a fun and busy summer so far, Anne... Sorry to hear the heat is so bad--we've had a cooler than normal July with more rain. It has been a very odd summer so far! I loved catching up on all your projects--just lovely. And what great charts you were able to find online. I know you'll love Nina's Threads--they are such nice thick ones and have such beautiful colors. Your necklace is such a pretty one, too--what a sweetie your husband is! 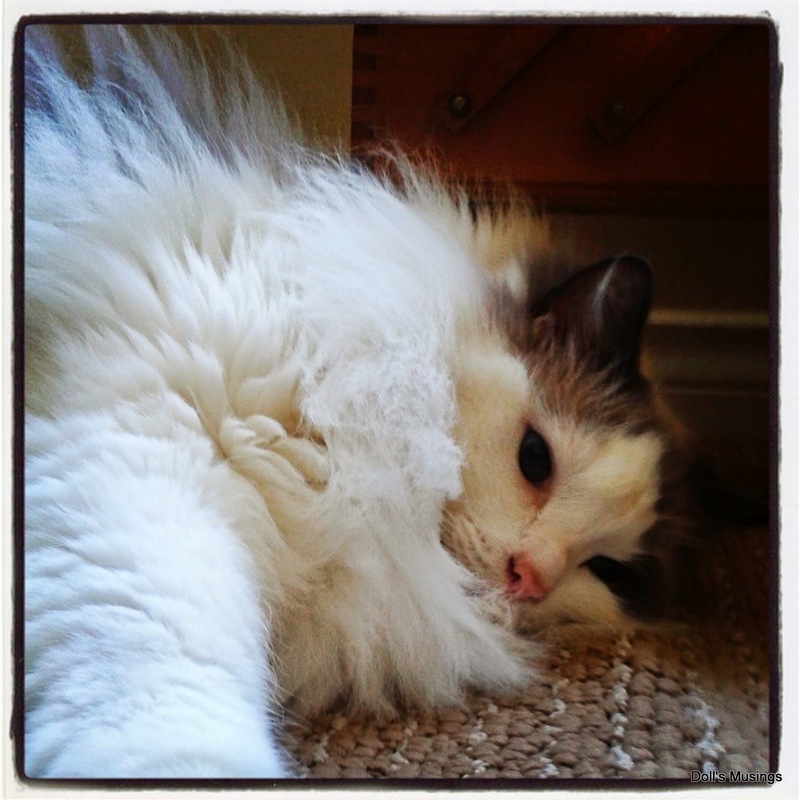 Hope you and Titus experience cooler weather very soon--that can't be much fun for that fluffy furball! Enjoy your week--will email you soon (just got back from vacation!). Hope that heat wave breaks soon, in the meantime stay cool! I know you work in education... here in Ontario we have something called Edvantage its a discount network for educators. I get my Goodlife membership for about $300/year half price! The only way I can justify the cost of a gym membership. Is there something in BC like that for you? Your stitching is beautiful and what a sweet RAK from Mii. Stitchers are the most wonderful people! 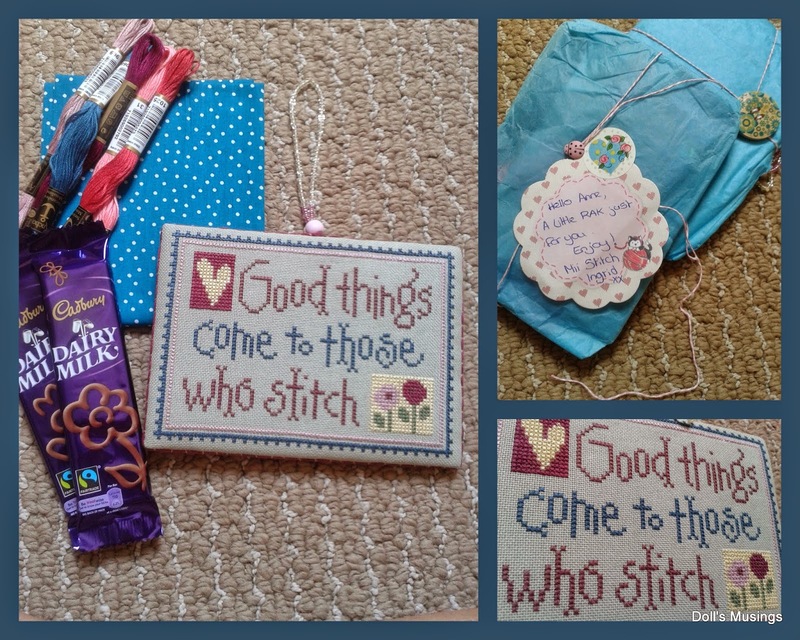 You're so right...stitchers are the most wonderful people - and what a lovely gift from Mii, she's such a sweetheart. Glad you were able to get some stitching and crochet done, they are looking really good. Lovely gifts form your hubby! Great update Anne. Love all your stitching. Beautiful necklace. What a gorgeous necklace, it's so beautiful - enjoy wearing it Anne. I do like the sampler you're currently stitching the grass area onto - it's very bonnie. Titus is such a handsome fellow, I always enjoy seeing him in your posts. Love all your stitching. It's all gorgeous! beauty and brawn -- lol! What a combo of gifts! Lovely gift from Mili too! Sorry it's so hot. What a bummer. I hate hot, hate humid especially! Love your beautiful wips! Wonderful trip photos, thanks for sharing! Your husband has great taste, love that necklace! I am not blogging much too, blog has not been updated for quite a while ha ha! Congrats on all your beautiful stitching you've gotten done. Every one of your projects are gorgeous! 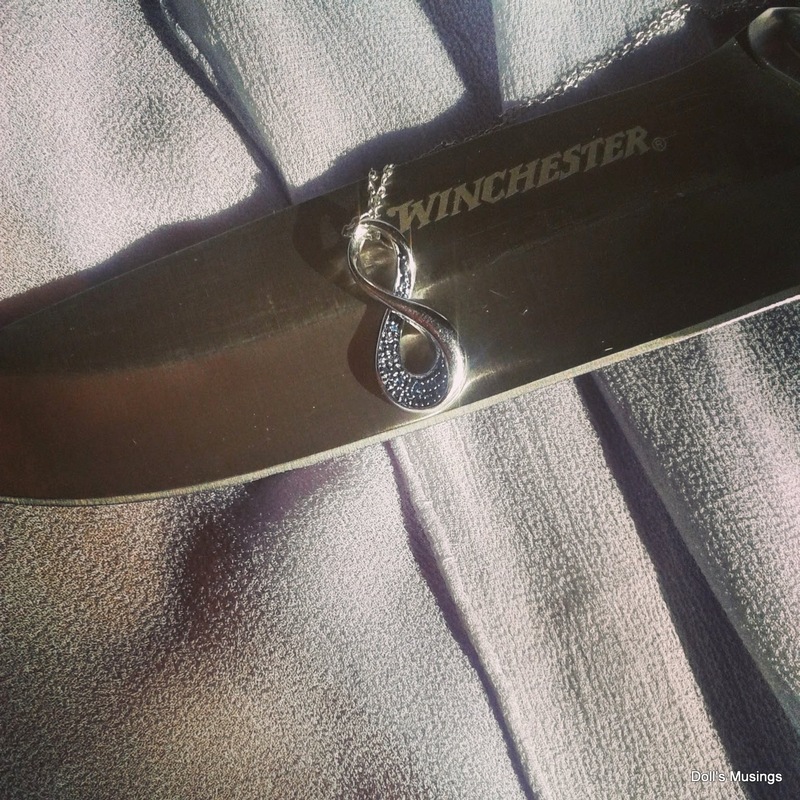 Speaking of gorgeous LOVE your necklace from your hubby. How sweet of Mii to surprise you with such thoughtful and beautiful gifts. It's been super HOT here too! Hi there! Glad to see your progress on projects... the grass is so pretty...tedious but worth it! And your work on the BBD chart--amazing! All those eyelet stitches! Phew! The blanket is great--the colors are so vibrant! What more can I say!? You and Hubby always go on great trips. I have a pink diamond that my hubby gave me, but blue... cool! Hugs! 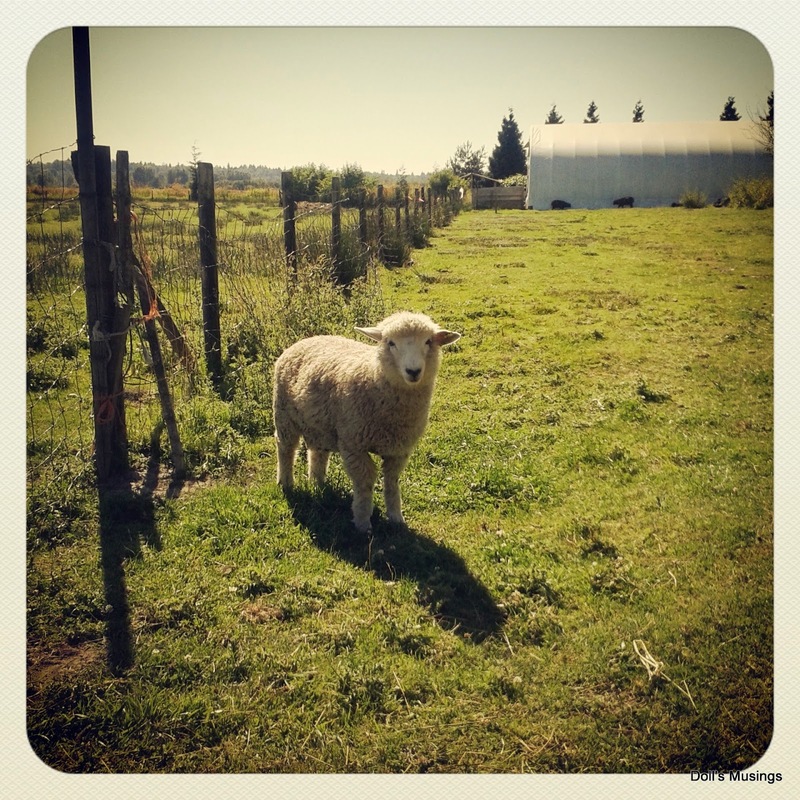 What a lovely newsy, picture-y post! You've been busy! Yeah it's been too hot for me. Poor Titus must be sweltering. You just need to give him a summer crew cut! lol. Will reply to your other email in a mo. Oh, poor Titus! It must be so hard having all of that beautiful fur during the hot times. 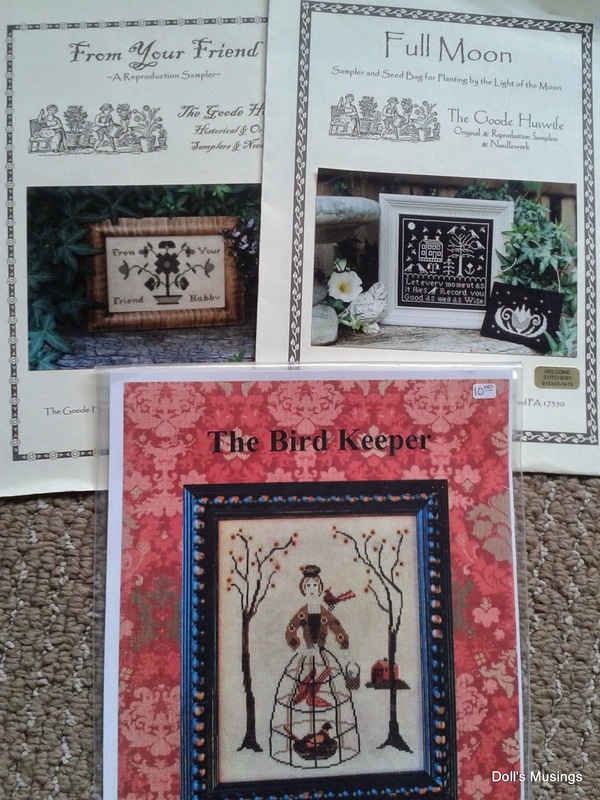 Looks like you have been busy with lots of lovely stitching. 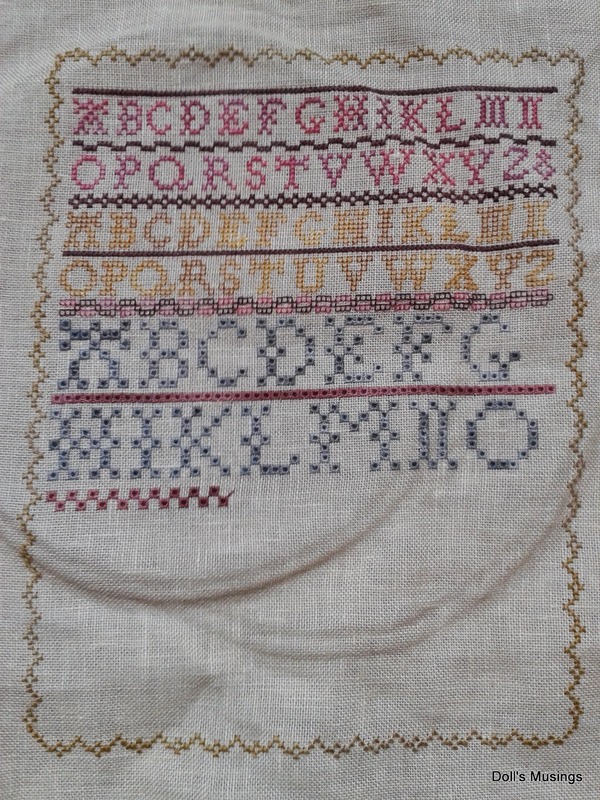 I came across Sarah Chapple the other night and was thinking I've never seen anyone stitch it ~ it is such a pretty sampler and I'm really going to enjoy watching your progress. Glad you made it through all of that grass. :) I've been tempted to try Nina's threads. They come in such beautiful colors. I'm really loving the colors in your blanket! 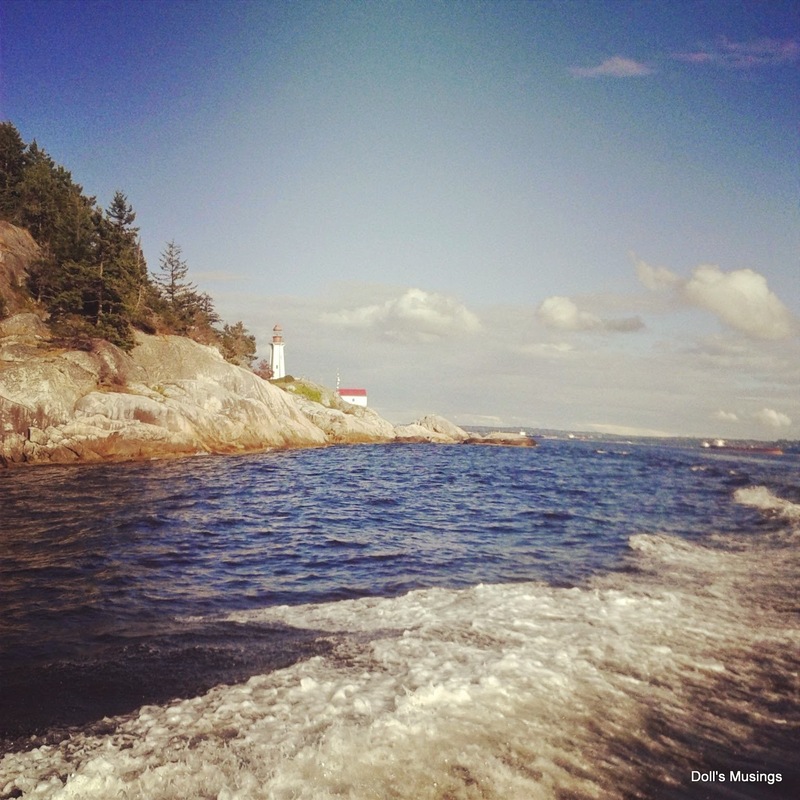 Enjoyed the adventure photos ~ the trip to Bowen Island sounds like it was a lot of fun. :) Interesting combination of gifts from your husband ~ but lovely. Take care and stay cool. Great to hear from you. Sorry to hear that things aren't going great for you at the moment. I hope they get better really soon. Lots of lovely progress on all your projects. What a lovely RAK from Mii, what a sweetheart she is. I have been hearing of your heat wave on our Weather Network and I hope it's not heading East anytime soon :) Lovely stitching, lovely photos. I hope you and Titus manage to stay cool! Titus is such a darling especially in the last photo. 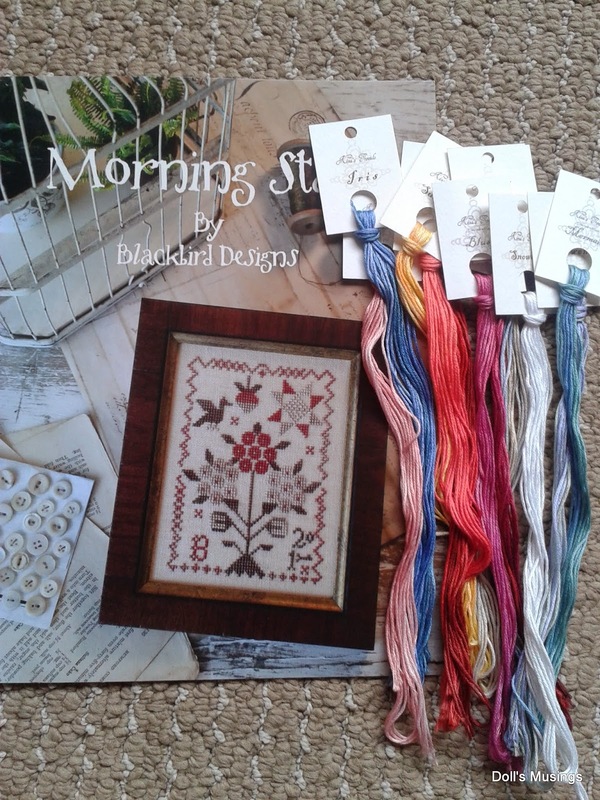 All your stitching progress beautifully and lovely colors combo for your grannies too. Thanks for sharing the wonderful photos from your adventure. Beautiful stitchingand wonderful photos from your trip. Love your new stash and what a fantastic package from Mii. Stitchers really are the best. Titus is such a cutie. You do have to feel sorry for animals this weather if they are not used to the hotter climate. A lovely gift package. All of your stitching and crocheting are beautiful. Great new stash. I don't necessarily think you need gym membership to be able to exercise, just be disciplined! Wow, you have been busy despite the heat. The eyelets are looking good but oh! that grass, I don't think that I would have the patience for that even while watching TV. Mii has sent you such a lovely gift, proper chocolate from Cadbury's too! your granny stripe is growing well.. beautifull job!! Soon after the heat of the summer, I will finsih Kira's blanket!! Your stitching pieces haven lay in teh closet.. hihi.. you are busy on them. And how sweet of Mii..
Hope all is getting better very soon for you both.. 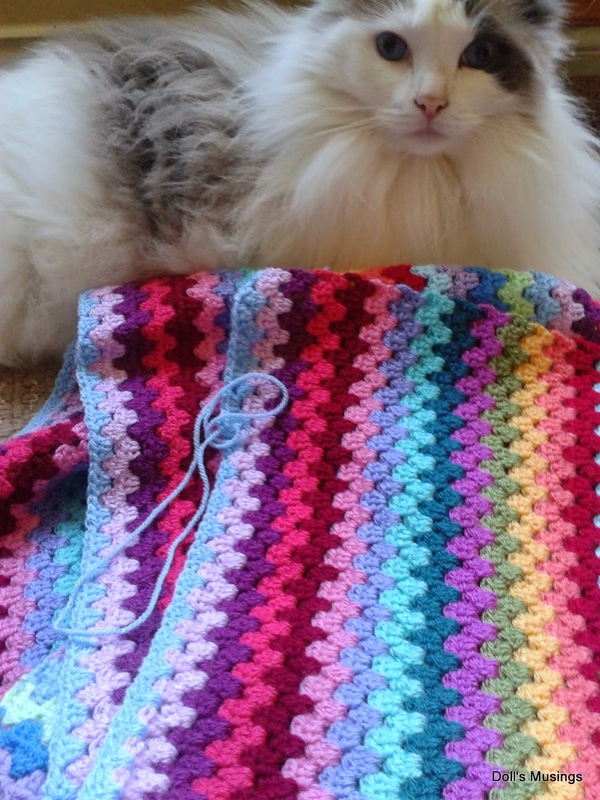 Your quality controller seems very pleased with your progress on the crochet blanket. 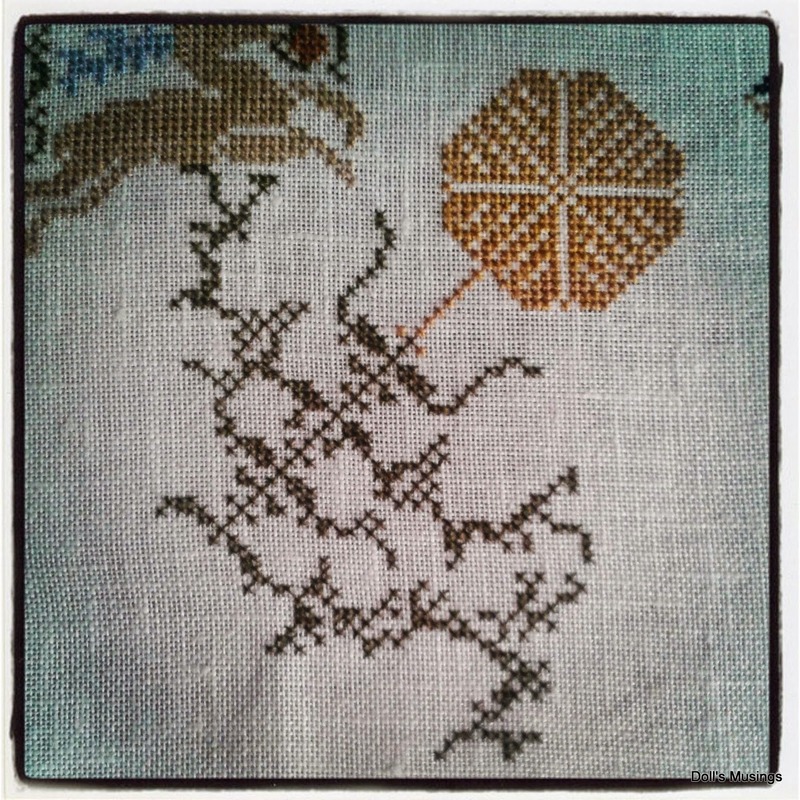 Lovely pics of your travels and super stitchy progress too. 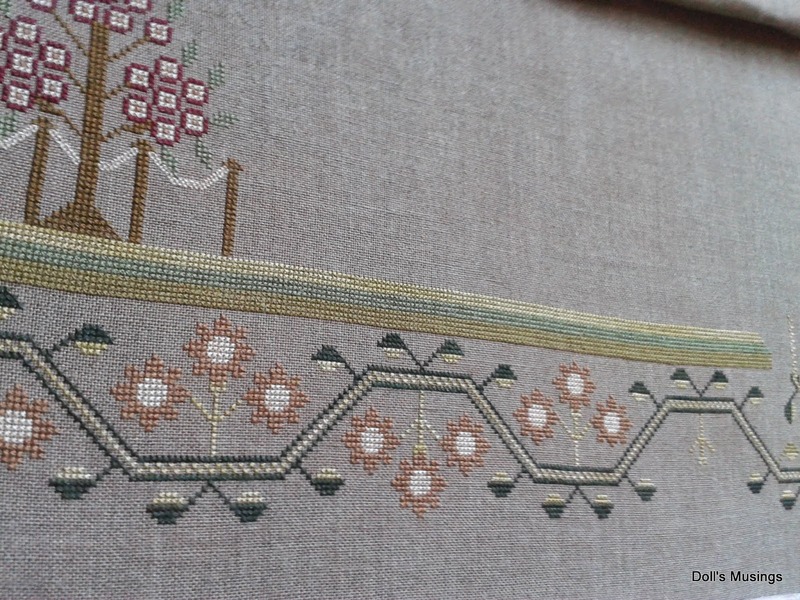 Wonderful post full of beautiful stitching. The gift from Mii is lovely. I love your granny stripe and would like to do one if and when I ever finish the granny square blanket I've been crocheting for two years now. Lovely pictures of your days out and about. Being into spinning these days I especially like the sheepie one. I never see sheep here in this area of Spain. Plenty of goats though! suggestion for helping Titus keep cool - used for our rabbits who loved it - buy something unhealthy in a 2 liter plastic bottle, drink it and then refill with water and freeze. Bunnies love to stretch out next to the bottle. I was going to do that BBD freebie - had the colors picked out and everything - but all those specialty stitches scared me off. It's such a great little piece though. Your projects are all looking lovely, great progress. Cute gift from Ingrid. It sounds like we have been in the same boat of busy-ness! I don't go to the gym either...it's not so much the money as the inconvenience and the lack of desire to have other people look at me while I do my pitiful little workouts, LOL!! 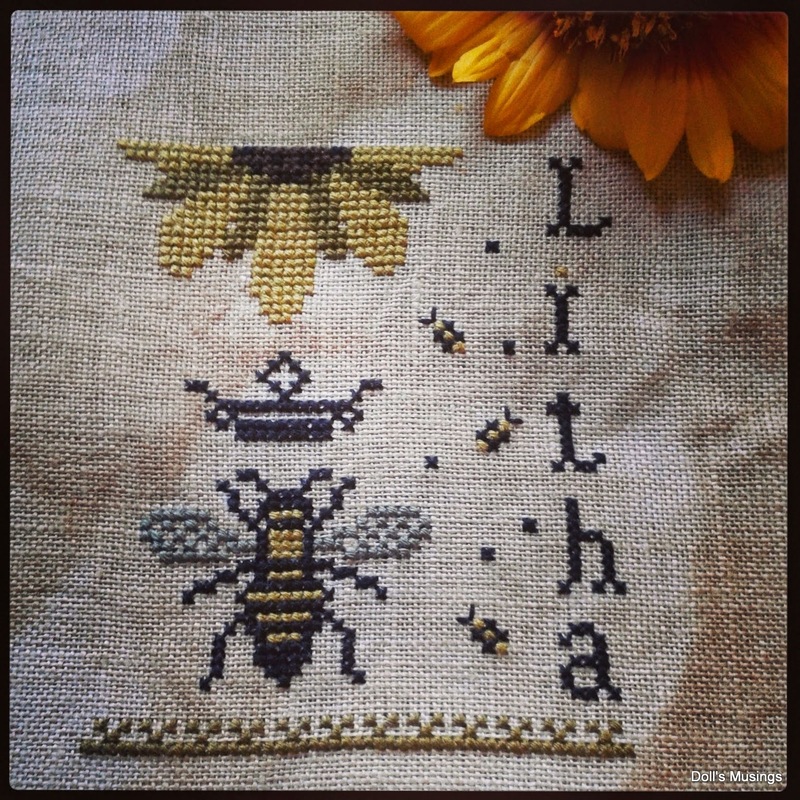 Great update on your stitching projects, and wow, such lovely new stash. Goode Huswife charts are so hard to find nowadays, it's a pity that she stopped designing quite a while ago. You are right, it's not very enjoyable to do any kind of needlework when it's hot. We also had our first heat wave last month and it was terrible, hot indoors and outdoors. I always feel like paralyzed when it's so hot and have to enable all my mental force to do things, no matter what, lol. I hope that in the meantime it has cooled down a little bit where you live. Such beautiful pictures from your trip to the island. And wonderful gifts from your husband. I hope all the doctor's appointments are over and you are feeling much better by now. I enjoyed all of the beautiful pictures and crafts. Your necklace is so pretty and what a nice gift from Mii.